You must make reservations at least 5 minutes in advance of the time at Mykonos Kuzina. Our passion for the Greek / Mediterranean cuisine has created many wonderful recipes which we like to share with all of you in the beautiful Southwest Florida. Christo is a self-made chef specializing in the fusion of traditional Greek cuisine with a contemporary twist of new ideas, herbs, spices and cooking methods. Dena is a self-made pastry-chef which has learned the difficult and delicate art of old style pastries and desserts. 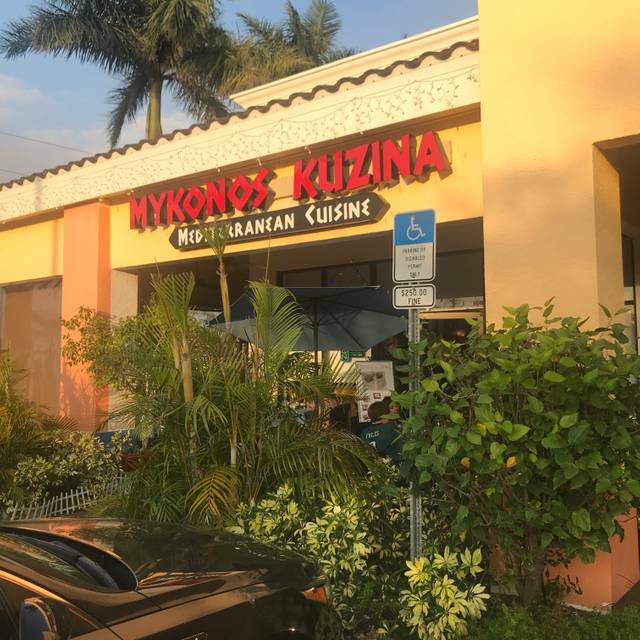 Together, we invite all of our guests to visit Mykonos kuzina for a wonderful meal in a comfortable and beautiful setting indoors or outdoors. Kefalograviera cheese flambé at table side ~ Opa! Large shrimp flambé at table side ~ Opa! Chocolate cake filled with a creamy mousse covered in a thick chocolate ganache. A Greek favorite! always good food. owners make you feel very comfortable and are attentive to you visit. Been here before. Came back because the food is so good. Octopus appetizer is fantastic - very tender and flavorful. Love the Shrimp Souvlaki - 6 good size shrimp brushed with a light lemony sauce and rice pilaf. Husband had lamb chops - cooked to perfection with roasted potatoes and vegetables. We'll be back. Great service and food. Noise level allows conversation, a rarity in Naples. A neighborhood gem. I took my husband for his birthday and we really enjoyed the experience and the food. The staff really took an interest in making sure everything was just perfect from the food to the atmosphere. Definitely one of our favorite places. The food is outstanding! Loved the video of Greece playing and the music was perfect! The young waiter we had was phenomenal. He was very helpful with what we decided to order and offered very good service with a great smile and personality. Server was very friendly and attentive. Been to this restaurant several times. Food is always good. The food at Mykonos is wonderful. The owners and servers as so friendly and attentive. We love eating in this small Greek restaurant. We love this restaurant and look forward to the summer specials! This is a hidden gem. Family owned and you know it - they make you feel a part of the family! Attentive service and thorough. Food is delicious - dolmades, saganaki, Greek salad, shrimp souvlaki, gyro and branzino were excellent. We love the Greek red wine King of Hearts. Dessert was baklava and galactabouteka (?). Again delicious. We love it and love that it’s so close to us. Excellent Greek food . Service was perfect...attentive and ever close but never in the way. Went with another couple and conversation was easy in this fairly quiet setting. Everyone enjoyed their dishes. Very accommodating. Arrived more than a 1/2 hour early and they seated us. Server very knowledge. Gave us good drink and food recommendations. We have been to Mykonos many times now, and the experience is excellent each time. We especially enjoy the family atmosphere, where every guest is made to feel special. Just love Mykonos Kuzina!!! Wonderful family, wonderful food and always a wonderful evening!! Excellent as always. My husband and I usually sit at the bar, but we brought a guest and sat at a table. We asked for Costa who usually helps us at the bar and the service was excellent, as usual. It is not only the best Greek food in Naples, but the best I’ve ever had in all the different cities we’ve lived. The service and ambiance is always superb as well. We brought my mom and now it’s one of her favorites too! The waitress was fabulous. The food was good--ample gyros. I felt there should be more pita bread on the plate. It's a charming experience to visit with the waitress for a minute or two. It made me uncomfortable when the owner whisked her away. Food was basically very good. Although I ordered the Lamb Med/Rare and it arrived Med/Well. Server, Barbara was very attentive even though she was busy. We will return and give them another chance. Once again, a wonderful meal! Mykonos is not large and it is not fancy, but the food is delicious and many returning customers get hugs on the way in. It is easy to smile at Mykonos. Terrific food all home made. A friendly family owned Greek restaurant with flaming cheese, grape leaves, egg lemon soup and even home made desserts. We enjoyed the lamb dishes, but our vegetarian guests were delighted with lentil soup and meatless grape leaves. The food is great and the atmosphere very homey! Had family in for a week. It was so much fun sitting outside talking and having great food being casual!! We started with a spanakopita. It was just the right combination of spinach and cheeses. It had a very slight hint of mint and lemon. Delicious. Very good gyro. Fresh and moist with plenty of meat. I believe my dish if the lamp chops was the standout. Three perfectly placed chips were atop a medley of grilled vegetables. I substituted mashed potatoes for the oven brown potatoes. Delicious. Can’t wait to head back. Everything we ordered was delicious. And the service was super friendly. We’ll definitely go back. Great family ran authentic Greek restaurant. This place is a hidden gem tucked away in a small North Naples strip center. Appetizers, entrees, deserts, everything was really outstanding! For sure we are going to go back! Great casual atmosphere with very good food. Perfect for pre-theater. We had the chicken on a skewer and their house salad. Both were excellent . A very good Mom & Pop Greek restaurant. Food and Wine was great. All in all an excellent experience. Super authentic food. Great service. Good value for the money. The Shrimp Mykonos was fabulous, as always. We love the Greek Salad, and the avgelomo soup is to die for. The staff are like family. Food was good, outdoor seating was nice but tight table for two. After we had been waiting for 35 minutes for dinner (which wasn’t too long since we had an app) we were told one of the 3 entrees we ordered was sold out. That’s something to be told as soon as the ticket went in not 35 minutes later. Had to reorder and by the time we got the food it was an hour. Might have given +1 star if the owner/manager came by to apologize. That never happened although it was obvious she was aware. To top it off they charged us full price for the third entree. Free baklava that nobody wanted was their poor attempt at a remedy. No complaints on the taste of the food or our server but obviously a poorly run business. Four of us and all loved our food. Lamb Chops, Lamb Souvlaki, Lamb Shank, and Lamb Yiouvetsi. Shared a key lime dessert and a baklava cheesecake -- would rate both of those just OK. Sadly too much food for us to order appetizers which look great. Wish they had liquor (not just beer and wine). But we'll be back. Food was excellent!!! Service from Costa was excellent!!! It was a wonderful experience!! We have dined there before and will do it agin and again!! And recommend it to all our friends!! Thank-you for the birthday dessert!! !